We bring together art education, mentoring, self-expression and peer support to help you achieve your personal goals in life and contribute to your community as working artists. 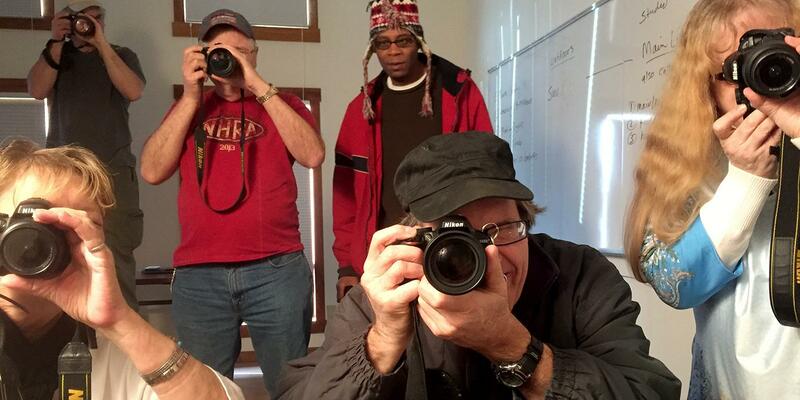 Each year we offer a 30-week photography program for adults and a 10-week program for teens. Classes are led by photography instructors with support from peer mentors and Ohio University photography students serving as volunteers and interns. Is Athens Photo Project right for me? Ever feel like your perspective doesn’t matter? That people don’t know the real you? Do you feel like you don’t matter to the world? Everyone experiences these feelings at times. But living with an ongoing mental health issue can allow these feelings to take over. Many APP artists arrived feeling alone in the world. But when they learned to express their thoughts and emotions through photography, they found a new freedom. They renewed their relationships with nature, people and their community. It’s a kind of unpredictable magic that blossoms in our classes. There is no right or wrong way. You learn about the creative force inside you that emerges in the artistic process. This force brings a fresh vitality to how you see your world and how you see yourself. Visit the become an artist page to learn about requisites to join us. Learn to use your camera as a tool for self-expression. Learn how to create and sequence a photo series. Create your own photo book. Broaden your self-expression by combining photography with other visual media and writing. Deepen your understanding of art critique through personal reflection on the process, exposure to various methods, and experiential practice within a supportive group. Join a peer-led group and develop skills to produce handcrafted photo products. Represent APP at various events and festivals throughout the year, including the popular Nelsonville Music Festival! Team with APP staff and artists to produce community exhibitions including APP’s annual juried exhibit, and APP’s permanent, rotating exhibits in Uptown Athens and at The Market on State. Learn the basics of photography as a tool for self-expression. Create a public art installation using oversized wheatpaste posters. "Some days I’ll think of going out to shoot and I’ll say to myself, “Oh no, you won’t get anything today, why bother, better to just stay inside.” Then if I can just put one foot in front of the other and get out the door to start walking, I shoot a roll of film, and then another, and sometimes even three rolls. It’s exciting, and it has helped my self-esteem and social anxiety. The class has taught me that I am able to be part of a group, and they have come to be like a family to me."